Heat oven to 350°F (325°F for dark or nonstick pans). Grease two 8- or 9-inch round cake pans or 13x9-inch pan and lightly flour, or spray with baking spray with flour. In large bowl, beat cake mix, orange juice, oil, pineapple, orange peel, vanilla and eggs on low speed 30 seconds. Beat on medium speed 2 minutes. Stir in nuts, coconut and raisins. Pour into pans. Bake 8- or 9-inch rounds 30 to 35 minutes, 13x9-inch pan 37 to 43 minutes, or until toothpick inserted in center comes out clean. Cool 10 minutes. Run knife around side of pans to loosen cakes; remove rounds from pans to cooling racks. Cool completely, about 1 hour. Stir orange peel into frosting. Place 1 cake layer, rounded side down, on serving plate. Spread with about 1/3 cup frosting. Place other layer, rounded side up, on top. Frost side and top of cake with remaining frosting or frost top of 13x9-inch cake. Store in refrigerator. 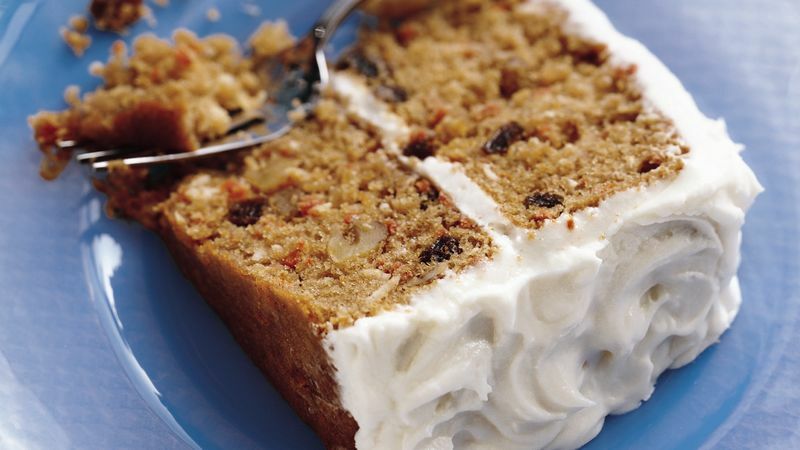 To cut cake easily, use a thin nonserrated knife. You can add 3/4 cup finely shredded carrots, if desired.